John’s Live Appearances « John Bartram Lives! To contact John Bartram through his amanuensis Kirk R. Brown email: vista6211@verizon.net. John Bartram regularly updates the places that he can be found in his many appearances. His sitings will be posted as they are known. He also takes this opportunity to post association and industry events that are noteworthy in and of themselves. Stay tuned for upcoming dates! 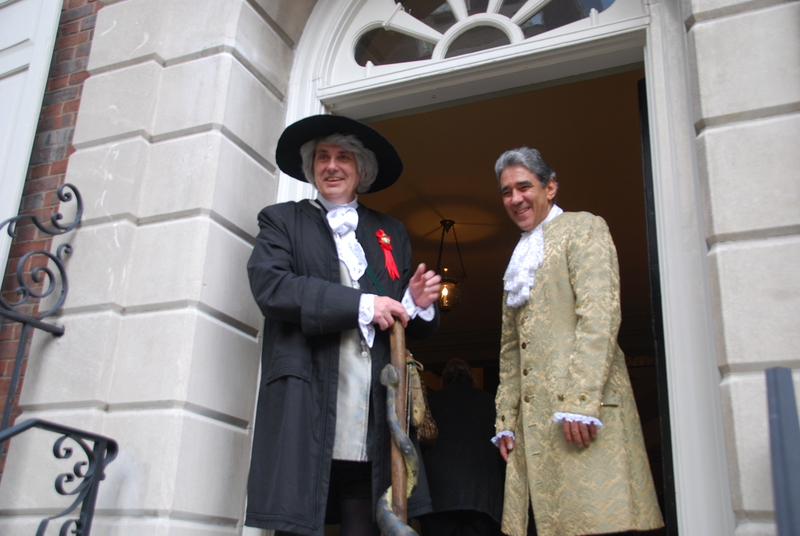 John Bartram appears as the welcoming host with the doorman at the the house of the American Society of Colonial Dames. Williamson Free School of Mechanical Trades. Technical advisor to their Philadelphia Flower Show exhibit on the colonial plant trade with Bartram’s Boxes. Philadelphia Flower Show–“Brilliant!” tribute to England and English gardening styles through the centuries. Kimmel Center: “Chef Walter Staib presents A Taste of History” Videotaped appearance with George and Martha Washington, Benjamin Franklin, John and Abigail Adams, Betsy Ross and Thomas Jefferson. Sustainable SITES and Washington Highlights. American University, The Capitol Building, Dumbarton Oaks. Garden Writers Association Region II Meeting organization and planning. Westchester University. Recognition of the University becoming an official Tree Campus USA host during Earth Week celebrations. Gordon Natural Area 40th Anniversary celebration. Zwingli Church, Souderton PA annual Gardener’s Day keynote speaker. Sustainable Gardening Virtual Library Forum Stakeholder’s Meeting. Longwood Gardens. Garden Writers International Symposium, Quebec Canada. John Bartram aka Kirk R. Brown has appeared at the following venues as key note speaker, horticulturist, business lecturer and/or design class presenter. National Safety Council Annual Symposium: John Bartram appears in festive guise for the annual Hallowe’en Party with Pennsylvania Horticultural Society. Lehigh Valley Rhododendron Society. Hellertown PA. Annual Muhlenberg Santa Lucia Service as Carl Linnaeus at the Viking Lodge/Scandinavian Christmas Dinner. Heard from Joanne Kostecky that you will doing a show on Frederick Law Olmsted. When and where??? Nancie Kennedy has asked me to come and see your performance in relationship to the Annap Hort Soc’s programs. She indicated that you would be at the Philly Flower show on March 2. I have search their website and see that the show starts on March 4. Can you tell me if you will be there, if so the date, and who I can contact about tickets. Nancie Kennedy has asked me to attend one of your performances for our Program Committee. I was told you would be at the Philly Flower show on March 2. I have combed their site and see nothing about it. Additionally, it appears the show doesn’t open until March 4. Could you give me any info about your performance there and who I can contact about tickets for it. The appearance at the Flower Show is unconfirmed as to date/time at this writing. It would be under the sponsorship of Mantis Tillers. Kirk will be at the show for meetings over the weekend prior to opening on Monday morning. We can stay in touch in the mean time. In the normal presentation venue associated with the show, all you need to pay for is the admission to the Flower Show Floor. All lectures and presentations are included in the price of the overall admission. Just had a most delightful experience at the 30th Davidson Horticultural Symposium…”John Bartram’s” presentation was not only historically appealing, but entertaining as well. I feel so fortunate to have been present at this wonderful lecture! Blessings on your house and garden. It was a glorious opportunity for John to return to his roots. Your presentation on ‘Quaker-Made Gardens” at Northampton Community College today was excellent! Enjoyed your return visit very much. Pleased you will be teaching at NCC in the future. Thanks for your kind words. I’ve been very busy on the road! I am back at NCCC on Wednesday night teaching a new course on Landscape Lighting. Something entirely different! Marsha sent me my reviews. I’m hoping to come back in the Fall with another new lecture.